SEO stands for search engine optimization, which is the process of getting your website to show up naturally on search engines results without having to pay for it. It is combined from the page titles, descriptions and content that you have added on the website. There are basics that need to be taken care of before you share your website with the world. Make sure you have added page descriptions and images since this is essential for all sharing related — Google and, for lack of a better example, Facebook are displaying that info along with your web links. If you're good to go, submit your domain to Google Search Console URL Crawler. Google adds new sites to their index, and updates existing ones, every time they crawl the web. If you have a new URL, tell them about it through the previous link. Note that they won't add all submitted URLs to their index, and we can't make predictions or guarantees about when or if submitted URLs will appear in their index. Google also asks for your website sitemap. This is necessary so that the Google robots can scan your site structure and index it in the search engine. 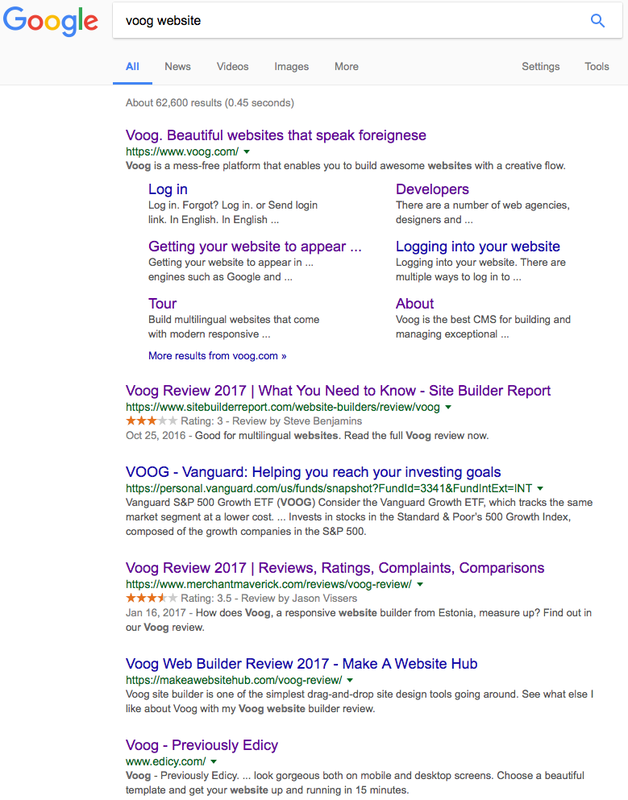 If you've built your website with Voog, its already available to them and you don't have to take any extra steps to submit it. Google Webmaster Tools, also known as the Google Search Console, is a free service offered by Google that helps you monitor and maintain your site's presence in Google Search results. Signing up can help you understand how Google views your site and optimize its performance in search results. Before you proceed, we kindly suggest to go over the Webmaster Guidlines. They help you understand various specifics that will be useful down the line. Also, check out the instructions on how to use the Search Console tool with your website. It gives you answers on how to update your content on Google and advises how to work towards achieving the number one spot on the search results. To join the Google Webmaster Tools you first need to have a Google account and personal domain address. Once you've done that and have access to the tool, add your website address as a property in the console. Of course, Google asks for verification to confirm that you are the owner of the website listed. Choose 'HTML file' as the verification method, which should give you a code that looks similar to this: "googlef52f1d814b8972e9.html". Copy the file name and paste it in your Voog console, in the 'Settings > Site' menu. You can add the verification code to your site in the 'Settings > Site' and add it to the Google Webmaster Tools line. Once you've done that, you should see a confirmation in the Google Webmaster Tools console in a little while. What about other search engines, such as Bing? There are multiple search engines out there, none as powerful as Google. However, if you have interest to join, for example, Bing search engine, it's a relatively similar process to the one described above. Check out the necessary steps here. Note that Voog doesn't support the XML verification method and we recommend the META-tag method. I've recently updated my website but the search engine is still displaying old info. What to do? If you've changed your website structure, deleted any pages or even added new ones, it's always good to ask Google to recrawl your website. It's a simple process and you can do it here. Check it out — it's a great tool because it keeps your website information updated in the search results. You can read a more detailed guide in our blog entry here.